Now in its second year, the 2013 Luxardo Cocktail Cup spurred hundreds of entries from around the United States. 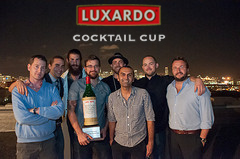 In the end, only seven would make it to the finals in San Francisco and just one would be crowned the 2013 Luxardo Cocktail Cup Champion. Finalists included Ann Maynard from Austin, Naomi Levy from Boston, Liz Pearce from Chicago, Brittini Rae from Los Angeles, KJ Williams from New York City, Michael Jack Pazdon from San Francisco, and Nik Virrey from Seattle. 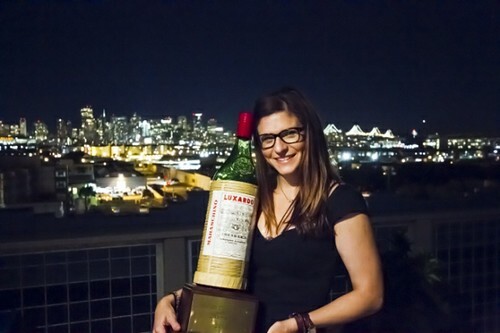 The finals were held at the Anchor Distilling Co., in their penthouse bar overlooking the city by the bay on a beautifully warm and uncharacteristic October evening. Judges included 6th generation Luxardo, Matteo Luxardo, Nevada’s Southern Wine & Spirits Director of Mixology Francesco Lafranconi, Anchor Distilling Co. President David King, USBG National President David Nepove, and Mutineer Magazine's Editor in Chief Brian Kropf. Only one could win and Los Angeles' Brittini Rae of Goldie's stole the show with her California Aurora cocktail. Second place went to San Francisco's Michael Jack Pazdon of Goose & Gander and third place went to Boston's Naomi Levy of Eastern Standard Kitchen. In a small tin, lightly press the sage and add all other ingredients except the lager. Add ice, shake, and strain into an ice filled collins glass. Top with Anchor California Lager and garnish with a California Poppy Flower and sage leaves.